WE are able this week to give particulars and illustrations of the latest product of the Bristol Aeroplane Co., Ltd., of Filton - the Bristol "Badminton." Incidentally, also, this ДальшеMore>>> machine has been entered by Sir George Stanley White for the forthcoming King's Cup Race, in which it will be piloted by Capt. F. L. Barnard. In this connection it will be the only entirely new type of machine taking part in this year's King's Cup Race - at least, as far as we know at the time of writing. 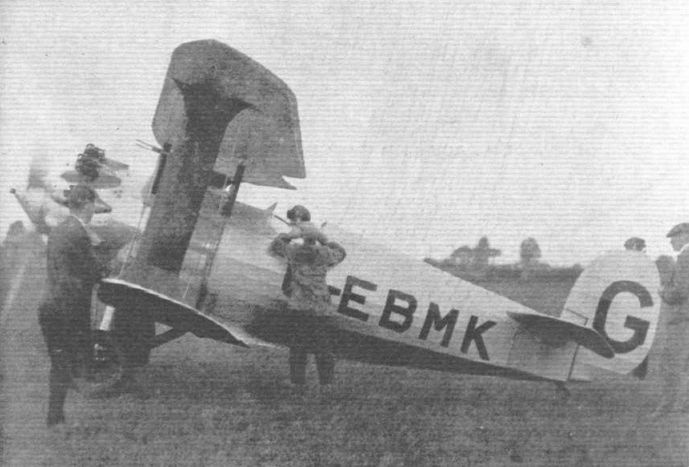 The Bristol "Badminton," Type 99, has been designed to provide a really fast aircraft equipped with a radial air-cooled engine, whilst at the same time no sacrifice of strength or safety has been made in order to produce a pure racing aircraft. In other words, the "Badminton" may best be described as a cross-country racer. 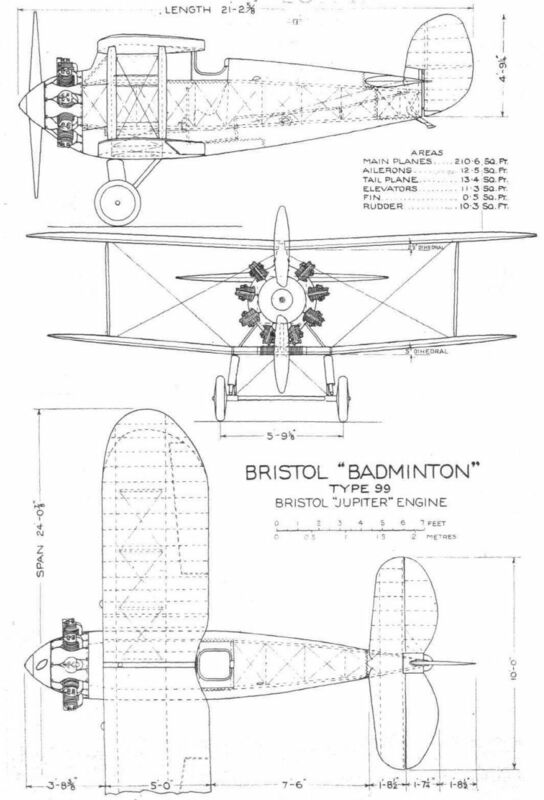 As will be seen from the accompanying illustrations, the "Badminton" is a tractor fuselage biplane and, externally, constitutes a highly modern version of the famous Bristol "Bullet" which put up a good performance in previous aviation events. Actually, however, it is a vastly different proposition, and from the technical view-point possesses numerous extremely interesting features. The main planes, of which the top one has a slightly larger span, are more or less of normal design having front and rear spars, ribs and leading edge of silver spruce, and a trailing edge of steel tube; the usual internal drag struts of steel tube and cross-bracing of H.T.S. tie rods are also employed. An unusual feature of the wing construction, however, consists of the spar arrangement. Each spar consists of a pair of channel section members, back to back, with a space of about 1 1/4 ins. between their backs, in which spaces are fitted the anchorages for the external bracing wires and interplane struts. These anchorages each consist of a large diameter hollow steel pin which passes, fore and aft, through the neutral axes of the pair of spar members. Threaded on to this pin, in the space between the spar members, is a pair of nickel steel links, one with a forked and the other with a plain eye; to the screwed shank of the latter is screwed the end fitting of the interplane strut, while the end of the flying wire is attached to the forked end of the link. This arrangement ensures no offset bending moments and gives as direct transmission of stress from strut to wire and from spar to wire as is possible. Top and bottom wings are of similar construction, but ailerons are fitted to the latter. The ailerons taper from tip to root, and it should be noted that their outer ends fall somewhat short of the wing tip. These ailerons have hollow box spruce spars, hinged to a false spar in the wing, and they are actuated by a single crank on the underside of the aileron connected by a push and pull tube to the aileron control gear passing through the lower wing to the control column in the fuselage. “Bristol No.1A" wing section is used for the top plane, which has a dihedral angle of 2 ? deg., and "R.A.F. 25" section is used for the lower plane which has a dihedral of 5 deg. The top wing anchorage consists of two posts (front and rear) mounted vertically on the centre line of the top of the fuselage, built up each of a pair of sheet steel channels braced to the top corners of the fuselage by tubular struts. These posts are connected at their upper ends by a tubular steel strut, while a drag strut also connects the upper end of the front post to the engine mounting plate. The "cabane" thus formed is very neatly paired into the fuselage and wings. The bottom wings are attached to a small centre section, which is anchored to the fuselage by a similar arrangement to that just described, except that the drag-strut is replaced by drag and anti-drag bracing of H.T.S. tie-rods fitted between the posts; in addition, four struts of streamline section steel tube are fitted between the bottom corners of the fuselage and the outer ends of the centre section spars. The centre section has spars, internal drag struts and trailing edge of steel tube, the ribs and leading edge being of silver spruce. The centres of the spars are attached to the feet of the anchorage posts, whilst M.S. fittings on the spar ends provide anchorages for the four streamlined bracing struts, wing bracing lift wires, and the upper ends of the chassis struts. It will be observed that an exceptionally neat streamlined fuselage obtains in the "Badminton." The main fuselage structure is of approximately square cross section. It is a braced girder consisting of four longitudinals, vertical and cross struts of silver spruce, braced by H.T.S. tie rods. The top and bottom of the fuselage, from front and back to pilot's cockpit, are covered with 3-ply wood. The rear end of the fuselage is also covered, top, bottom and sides with 3-ply wood for the extent of the two rearmost bays. The fuselage fittings, which attach ends of struts to longitudinals and provide anchorages for ends of tie rods, are of nickel-chrome sheet steel. The sternpost of the fuselage is of box section with sides of silver spruce, and front and rear faces of 3-ply wood; it projects about 12 in. above the top of the fuselage. The whole body is very carefully faired - the engine cowling forming the fairing back to the fireproof bulkhead; from fireproof bulkhead back to pilot's cockpit the "gravity" tank, "side" tank and oil tank conform to the faired shape, the spaces between tanks and between tanks and bottom centre section being filled in by detachable panels of sheet aluminium. The pilot's cockpit opening is faired in with sheet Duralumin; the port panel, being hinged along its lower edge to the top port longitudinal of the fuselage, may be folded down to allow of ingress and egress of the pilot, and is held closed by two self-locking bolts. Aft of the pilot's cockpit the covering is of standard linen fabric laced on in detachable panels. This cover is supported on closely-spaced fore and aft spruce stringers, which are mounted upon formers (of spruce and thin 3-ply wood) attached to the fuselage struts. The engine - a 9-cyl. Bristol "Jupiter," series VI., fitted with variable timing gear - is mounted on a square flanged mounting plate of mild steel sheet. Four tubular steel struts attach the corners of this plate to steel fittings bolted to the forward corners of the fuselage; cross bracing is by H.T.S. tie-rods. The very neat engine cowling is composed of two portions. The front portion consisting of 9 sheet Duralumin "helmets," fitting over each cylinder - each being easily and quickly removed - and the rear portion consisting of four sheet aluminium panels, top, bottom and sides, completely covering the engine. Top and bottom panels are attached by studs to the rear cowl-frame in front and to the edge flange of the fireproof bulkhead at the rear. The side panels have quick detachable fasteners and may be removed in a few seconds. The front and rear cowl-frames are of M.S. tube and are attached respectively to the forward end of engine crankcase and to engine mounting plate. Attached to the forward end of the fuselage, immediately behind the engine, is the fireproof bulkhead, consisting of a sandwich of asbestos sheet between two aluminium sheets. The tail plane is symmetrical about a horizontal plane of symmetry. It tapers in thickness and also, to a small extent, in plan. It is constructed of two box-section spars (built up with silver spruce flanges and webs of 3-ply wood) ribs of silver spruce, internal drag struts of steel tube, internal cross-bracing of H.T.S. tie rods. Its leading edge is covered with thin sheet Duralumin back to the front spar. A tail fairing of sheet aluminium is attached to the centre of the rear spar, filling up the gap between the elevator flaps. The tail plane is non-adjustable, being bolted directly on to four fittings on the top corners of the fuselage. The divided elevators, of steel and Duralumin construction, are mounted on a continuous spar of steel tube, in the centre of which is the operating crank to which is connected the control gear passing through the fuselage. The rudder is of the balanced type of ample proportions, built up of spruce spars and ribs with steel tube "edging." The vertical "fin" finishes almost before it commences and really consists of a sheet aluminium nose-fairing box screwed to the sides of the sternpost. An Oleo undercarriage is fitted, consisting of a pair of Palmer wheels mounted on a straight axle of n-c steel tube which is attached to a pair of Oleo struts and a pair of steel tube radius struts. The tail skid is of the non-steerable type with oil-damped absorber. The fuel tanks are three in number - a 15-gal. gravity tank within the top wing anchorage; a main 34-gal. tank inside the fuselage and 10-gal. tank alongside the latter. Petrol is pressure fed, although as the bottoms of the tanks are, normally, above the level of the carburettors, only a very low air-pressure is required. The oil tank is mounted on the forward right-hand side of the fuselage, and two oil coolers are provided, No.1 being incorporated in the leading edge of the lower plane centre section, and No. 2 being incorporated in the oil tank. There are many other important detail features of the "Badminton," but we are afraid that lack of space necessitates a description of these being postponed until a future issue of FLIGHT. We must, therefore, conclude this week's description with the following main characteristics of the “Badminton." Overall span 24 ft. 0 7/8 in. Overall length 21 ft. 2 3/8 in. Total, wing area 210-6 sq. ft.
Area of tail plane 13-4 sq. ft.
Area of elevators 11-3 sq. ft.
Area of fin 0-5 sq. ft.
Area of rudder 10-3 sq. ft.
Area of ailerons 12-5 sq. ft. Weight, per sq. ft. 11-68 lbs. Weight per h.p. 4-82 lbs. THE BRISTOL "BADMINTON": Three-quarter front view showing the very neat cowling over the Bristol "Jupiter" air-cooled engine. THE BRISTOL "BADMINTON": Side view of the new "cross-country racer" which will take part in the King's Cup Race, piloted by Capt. F. L. Barnard who is seen standing beside the machine. The King's Cup: The Bristol "Badminton" 400 h.p. "Jupiter" is the only absolutely new type in the race. THE FIFTH KING'S CUP RACE: Capt. 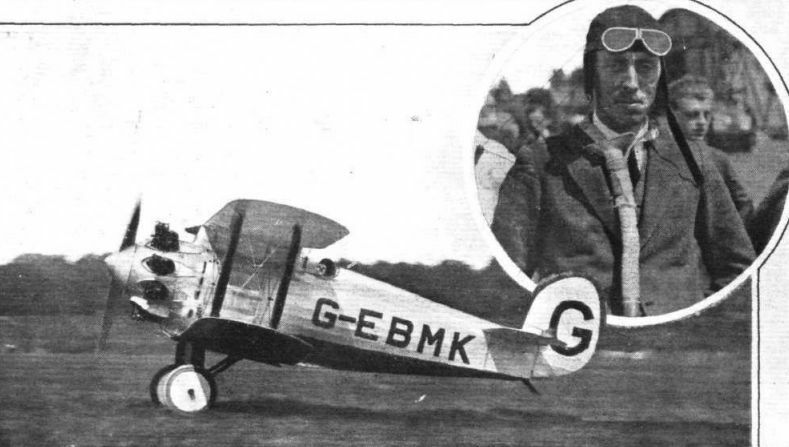 F. L. Barnard - a previous King's Cup winner and the Bristol "Badminton," on which he was unfortunately forced to land when on his last lap on the first day, owing to petrol feed trouble. Note Barnard's "fresh air breather tube." For the King's Cup Race: The Bristol "Badminton" with Bristol "Jupiter" engine on which Captain F.L. Barnard met with a fatal accident when he stalled the machine and crashed near Filton last week. Note the unusual plan form of the wings.